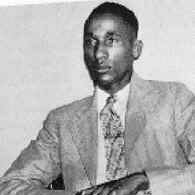 March 19, 1939 Lloyd Lionel Gaines, the central figure in the 1938 Supreme Court case Gaines v. Canada, disappeared. Gaines was born in 1911 in Oxford, Mississippi and at the age of 15 moved with his family to St. Louis, Missouri. He graduated with honors from Lincoln University in 1935 with a bachelor’s degree in history and in 1936 applied for admission to the Law School at the University of Missouri. He was rejected because of his race and Missouri’s policy to pay the expenses for the education of such black students at schools out of state. Gaines took the case to court and on December 12, 1938 the United States Supreme Court ruled that the State of Missouri had to either admit Gaines to the University of Missouri or provide another school of equal status within the borders of the state. Gaines never attended law school. On this date, he left his fraternity house to buy stamps and was never seen again. In 2001, the University of Missouri dedicated the Gaines-Oldham Black Cultural Center in his honor and in 2006 the university posthumously granted Gaines an honorary law degree.